Wadham Peacock read history at Cambridge University and worked ca. 1878-1880 as private secretary to the British Consul General in Shkodra, Sir William Kirby Greene. He is mentioned in 1880 by the Montenegrin traveller and writer Spiridion Gopcevic (1855-1936), whom he accompanied on a hike up Mount Maranaj and nearly lost his life in an avalanche. Peacock's decade of work in Albania gave him, at any rate, good insight into the country. Thirty years later, on the theshold of Albanian independence, he published the 256-page book "Albania: the Foundling State of Europe" (London 1914), as well as the following essay. Bismarck, with his brutal disregard of facts which did not suit him, asserted at the Berlin Congress in 1878, "There is no Albanian nationality." The Albanian League, even while he was speaking, proved that he was wrong; and now, more than thirty-four years later, when the work which the Congress of necessity left unfinished has to be taken another step towards its logical end, the Albanian nation provides one of the most serious of the questions to be solved by the Court of the Great Peoples. Fortunately for Europe, the agreement of the Powers is so overwhelming in its unanimity that Servia, the one Balkan State which ventured to proceed on the lines of Prince Bismarck's mistaken dictum, has been forced to withdraw her pretensions. There is now no questioning the decision that Albania is to be autonomous; the further questions: 'What is to be the status of the prince or ruler? ', 'What are to be the exact boundaries of the newcomer into the European circle?' and 'Whether the new State is to be shadowed by the nominal suzerainty of the Sultan?' are mere matters of detail which can be settled amicably by the Powers. The central and important fact is that Albanian nationality has been recognised by the European conscience, and that civilisation has been spared a twentieth-century Poland. Between the Albanian and the Slav there stand centuries of hatred and blood feud. The Albanian regards the Slav as an intruder and a robber; the Slav looks on the Albanian as an inconvenient person who, though occasionally beaten, has always refused to be conquered; and, having the inestimable advantage of being more skilled in literature, he has consistently represented the voiceless Albanian as a brigand and a plunderer of Slav villages. As a matter of history, the boot is on the other foot. Setting aside the fact that both Albanian and Slav can be, and are, brigands on occasion, the Albanian and his kindred had been for centuries quarrelling comfortably among themselves when the Slav hordes poured across the Danube, and drove the old inhabitants by sheer weight of numbers from the plains to the uplands, and from the uplands to the mountains. Among the inaccessible crags on the western side of the Balkan Peninsula, facing the Adriatic Sea, the remnants of the old autochthonous peoples of Illyria, Epirus, Macedonia, and Thrace, have for centuries held their own against the recurring floods of Kelts, Goths, Serbs, Bulgars, and Turks. Like the Montenegrins who hold the northern part of their mountains, the Albanians have been defeated, and have seen their villages burned and their families massacred, but they have never been finally conquered. The only difference is that while the Albanians had been defending their fastnesses for many generations before the Slavs of Montenegro came south of the Danube, they have never had the good fortune, or it may be the intelligence, to acquire a really powerful literary advertiser. Even Lord Byron passed them over in favour of the Greeks, though he credited the 'wild Albanian kirtled to his knee' with never having shown an enemy his back or broken his faith to a guest. It is unlikely that the liberation of Greece would have been obtained had it not been for the Albanian warriors who supplied the best fighting material for the insurrection. Admiral Miaoulis, the Botzaris, the Boulgaris, and many other heroes of the beginning of the last century, were Albanians, or of Albanian extraction, but the modern Greek lives on the literary achievements of the ancient Hellenes, while the strong men of Albania, like their ancestors who lived before Agamemnon, are relegated to obscurity because they have no one to focus the gaze of Europe upon them. Byron, Finlay, and a hundred others, did their best to make Europe believe that the modern Greek is the true descendant of the ancient Hellene, but none of them ever gave the Albanian the credit due to him. Then the fashion changed; the Slav came to the front, and Mr. Gladstone, Lord Tennyson with his Montenegrin sonnet, Miss Irby of Serajevo, and a host of writers, came forward to extol the Serb and the less sympathetic but still Slavised Bulgar, with the result that the average man believes that the Slavs were the original owners of the Balkan Peninsula, and that the Turks took it from them at the battle of Kossovo in 1389. The Albanian proud and silent on his crags, without even a disastrous battle to serve as a peg for advertisement, has through the centuries asked nothing of Europe, and has been given it in ample measure. Perhaps the Greeks did not live up to the glory that was expected of them, and so slipped into the background, but it is certain that the Slavs came to the front in the mid-Victorian days, and by 1880 were the pampered children of hysterical Europe. The Slavised Bulgar is a dour, hard-working man, self-centred and unpolished, and it was a little difficult to keep up the enthusiasm on his behalf to fever heat. But the Serb is outwardly a pleasant and picturesque creature, with a keen sense of dramatic values. Constantine, the last of the Byzantine Emperors, fell even more dramatically at Constantinople than did Lazar, the last Serbian Czar, at Kossovo-Polje, but the national mourning for the black day of Kossovo seems to have struck the imagination of Europe, while the historically far more important death of Constantine Palæologus inside the gate of St. Romanus on May 29th, 1453, has left it untouched. The Serb is sympathetic in the passive sense of the word; he attracts people with his easy philosophy and his careless way of treating and looking at life. The modern Bulgar does not attract. He inspires respect, perhaps, but not affection. In racial characteristics the Serbs are akin to the Western Irish and the Bulgarians to the Lowland Scotch; and the more plausible man naturally makes the more favourable impression on the passing observer. So it is that writers on the Balkans often unwittingly inspire their untravelled readers with the notion that the Serbs, now represented by the Servians and Montenegrins, were the original owners of the Balkans, but shared the eastern part with the Bulgars, while the Turks were intruders who unjustly seized the country and are now justly surrendering it to the rightful possessors. In reality, the Albanians, or Shkypetars, as they are properly called, represent the original owners of the peninsula, for the Serbs did not cross the Danube until about 550 A.D., nor the Bulgars till 679 A.D., when the Shkypetars had enjoyed over eleven hundred years' possession of the land, enlivened by petty tribal fights, battles with or under the Macedonian kings, and struggles with Rome. In every town and district which the Slavs can claim by right of conquest under some nebulous and transitory Empire, the Albanians can oppose the title of original ownership of the soil from ages when neither history nor the Slavs were known in the Balkans. The Romans, unlike most of the invaders who came after them, were administrators, and a province was usually the better for their rule. The Thrako-Illyrian tribes, now represented by the Shkypetars or Albanians, were, however, not seriously disturbed by the Roman governors and colonists, or, rather, they were neglected and allowed to lapse into a state of lethargy from the turbulent sort of civilisation to which their own kings had raised them. The Romans policed, but did not open up the country. But when the Slavs and the Bulgars swept over the land like a swarm of locusts, the original inhabitants were either exterminated or fled to the mountains, where they led a fighting existence against what was termed authority, but which, to their minds, was the tyranny of the supplanter and usurper. The five hundred years' struggle of Montenegro against the Turks has often been told in enthusiastic language. The more than a thousand years' struggle of the Shkypetars against the Slav and the Turk has always been passed over as an incident of no importance. The very name "Albanian" lends itself to prejudice. To the Western European it recalls the travellers' tales of Albanian brigands, and the stories about the Sultan Abdul Hamid's guards. The name sounds, and is, modern; whereas Serb, as admirers of the modern Servians very wisely write the word, has an ancient flavour. The tribes that are now known as Albanian do not recognise themselves by that name. They are Shkypetars, the Sons of the Mountain Eagle, and their country is Shkyperi, or Shkypeni, the Land of the Mountain Eagle. They have a legend that Pyrrhus, when told by his troops that his movements in war were as rapid as the swoop of an eagle, replied that it was true, because his soldiers were Sons of the Eagle and their lances were the pinions upon which he flew. If this story has any foundation in fact, it goes to show that the name Shkypetar was known to, or adopted by, the people and their king about 300 B.C., and one can only marvel at the modesty which dates the name no further back. At any rate, Pyrrhus, the greatest soldier of his age, was a Shkypetar, or Albanian, and beside him the Czar Dushan is a modern and an interloper. The name Albania was not heard of until the end of the eleventh century, when the Normans, under Robert Guiscard, after defeating the Emperor Alexius Comnenus at Durazzo, marched to Elbassan, then called Albanopolis, and finding the native name too difficult for their tongues, styled the country of which Albanopolis is the chief town by the easy term "Albania". The word, which does not appear to have been used officially until the first half of the fourteenth century, properly designates the land on the western side of the Caspian Sea, and much confusion has arisen from the Norman incapacity to wrestle with the word Shkypetar. Many educated Albanians claim that they are descended from the Pelasgi, but this is combatted by some European authorities. As we know next to nothing about the Pelasgi, the question resolves itself into a matter of speculation incapable of proof either way; but at any rate it is certain that the Shkypetars are the descendants of those Thrako-Illyrian tribes which, by whatever name they were called by Greek writers, occupied the country to the north of Hellas when history was emerging out of legend. The earliest known king of Illyria is said to be Hyllus, who died in B.C. 1225. Under his grandson Daunius the land was invaded by the Liburnians, who fled from Asia after the fall of Troy. The Liburnians occupied the coast of Dalmatia and the islands from Corfu northwards, and gradually became absorbed in the population. Only North Albania was included in Illyria, which stretched north over Montenegro, the Herzegovina, and Dalmatia. South Albania was known as Epirus, and this division of the country makes the selection of the historical facts relating to Albania as a whole more than usually difficult. But it is easy to guess that the centuries as they passed saw continual tribal fights between the Illyrians, the Epirots, the Macedonians, and the other Thrako-Illyrian peoples, and about B.C. 600 came the first of the great invasions of which we have any clear knowledge. The history of the Balkan peninsula has always alternated at longer or shorter intervals between local quarrels and huge incursions of barbarians who swept across the land and submerged the plains, but left the mountains unsubdued. It is in these mountains that Albanian history principally lies, for while the people of the lowlands absorbed or were absorbed by the invaders, the older races fled to the mountains, and preserved intact their primitive language and customs. The Kelts were the first barbarian invaders, and, as was usual in such incursions as distinct from widespread racial immigrations, they were probably a small body of fighting men with their wives and children, who were soon lost in the mass of the people among whom they settled. They were absorbed in the Illyrian kingdom, of which Scodra or Scutari was the capital, and, like the Liburnians whom they supplanted at sea, they gained fame and wealth as pirates in the Adriatic and even in the Mediterranean. In the first half of the fourth century B.C., Bardyles, the King of Illyria, conquered Epirus and a good part of Macedonia, but he was defeated and driven back to his mountains by Philip, the father of Alexander the Great. A little later Alexander, the King of the Molossi, in South Albania, made an expedition into Italy, and so brought Rome into contact with the opposite shores of the Adriatic. All these petty kingdoms were evidently merely subdivisions of the same race, and were closely connected with one another. The sister of Alexander, King of the Molossi, was the mother of Alexander the Great; the men who marched to Babylon, Persia, and India were the ancestors of the Albanians; and Epirus and Illyria shared in the anarchy which followed the death of the great conqueror, who has himself been claimed as a Shkypetar, and with considerable justice. Pyrrhus, the warrior King of Epirus, was undoubtedly a Shkypetar, and some sixty years after his death Agron emerged from the welter as king of Bardyles' old realm and also of Epirus. Like his kinsman, Alexander the Great, he was a first-rate fighting man, and like him he died after a debauch, leaving a widow, Teuta, who was a lady of much force of character. She is said to have stretched a chain across the river Boiana where two hills shut in the stream above the village of Reci, and to have levied a toll on all ships going up and down. The Albanians say that the rings to which she fastened her chains are still to be seen in the rocks. Moreover, she raised an army, built a fleet, and with less than modern Albanian caution set out to capture the island of Issa (now Lissa), which happened to be in alliance with the Romans. The republic sent an embassy to Teuta, but she slew one of the envoys and defiantly attacked Durazzo and Corfu. The Romans thereupon turned their arms to the Illyrian coast, and made short work of Teuta. She was driven from all the places she had occupied, even from her capital Scodra, and had to accept an ignominious peace. In spite of this the Illyrian Shkypetars had not learned their lesson, nor realised the growing power of Rome. Demetrius of Pharos, who succeeded Teuta as ruler of the country and guardian of Agron's son, although he owed much to Rome, began to rob and pillage the allies of the Republic, and endeavoured to unite the Shkypetar States in one alliance. He failed, and the lands of the Shkypetar fell under the power of the Romans, who contented themselves with exercising a protectorate over the realm of the young king Pinnes. The three Shkypetar States, Illyria, Epirus, and Macedonia, rose against Rome under Philip of Macedon, when Hannibal seemed in a fair way to crush the Republic, only a small portion of what is now Albania south of the Drin remaining faithful to its engagements. When the Carthaginian danger had been disposed of, Rome once more turned to the lands across the Adriatic. Gentius, the last king in Scodra, had allied himself with Perseus of Macedon, and had returned to the Adriatic piracy of his ancestors. Thirty days saw the fall of the northern Shkyperi kingdom. The praetor Amicius, in B.C. 168, landed on the coast and drove Gentius into Scodra, where the king soon afterwards surrendered at discretion, and was taken with his wife, his two sons, and his brother to grace the triumph at Rome. Perseus was utterly defeated by the Consul Paullus at Pydna shortly afterwards, and all the lands of the Shkypetar became incorporated in the Roman Empire. Epirus in particular was severely punished, and the prosperity of the country, which hitherto had been considerable, was completely ruined. The Shkypetars took to their mountains, and the Romans did nothing to restore the wealth and culture of the times of the native kings. The cities, even Scodra, fell into decay, and when Augustus founded Nicopolis on the north of the Gulf of Arta in commemoration of the battle of Actium, there was not a single city of any importance in Epirus or Illyria. Nicopolis itself did not last long, for under Honorius it had become the property of a Greek lady, and when Alaric and his Goths in the fifth century overran Illyria and Epirus, the city was sacked, and from that time ceased to be a place of any note. Under the Empire the deserted country was divided between the provinces of Illyria and Epirus, North Albania being the southern portion of Illyria. When the Roman Empire was divided in A.D. 395, the Shkypetars were allotted to the Eastern Empire, and the country was known as Praevalitana, with Scodra for its capital. The condition of the land must have been very much what it was under the Turks. The prefects of the Empire ruled on the coast and in the plains, but in the mountains the Shkypetars enjoyed semiindependence, and as a consequence of this neglect the country remained more or less derelict. But the Shkypetars were unquestionably the owners of the soil under the Imperial rule of Constantinople. In the fifth century came the first of the great invasions under which the Empire of Byzantium was finally to disappear. The rebel Goths, under Alaric, after invading Greece, swung north and ravaged Epirus and Illyria, provinces which they had so far neglected owing to the poverty of the land since the occupation by the Romans. When the Goths invaded Italy, Shkyperi enjoyed a period of comparative tranquillity under Justinian and until the coming of the Slavs. The Huns and the Avars were passing invaders; they did not settle on the land, but they drove the Thrako-Illyrian tribes, who spoke both Latin and Shkypetar, into the mountains, and left the way open for the Slavs. It was at the end of the sixth century that the Slav tribes, who had crossed the Danube in scattered bodies some three hundred years previously, came in overwhelming numbers to settle, and the lowlands were ravaged and occupied by them sometimes alone, and sometimes in conjunction with the Avars. The Thrako-Illyrians were at that time like the Romanised Britons; they had become enervated under the Pax Romana, and were unable to resist the ruthless invaders. They fled into the mountains of Albania, and there they gradually dropped the Latin language and the veneer of Roman civilisation. They were men who had to fight for their lives; the weaklings died off, and the old tongue and the old customs of the Shkypetars were once more assumed. The Serb, though a plausible and soft-spoken individual when he has not got the upper hand, is at heart a savage, and the Thrako-Illyrian tribes who were driven out of Thrace and Macedonia to the highlands of Epirus and southern Illyria were the sterner remnants of a population which had seen old men, women and children massacred, and homesteads burned by the invaders. Then began that undying hatred between the Shkypetar and the Serb which is bitter even to-day, for the Albanian still looks on the Slav as the intruder and the destroyer of house and home. This explains why the modern Albanian has always been more friendly with the Moslem Turk than with the Christian Slav. The brutalities committed by the Turks were trifles compared with the atrocities of the Slav. In the first half of the seventh century the Slavs were recognised officially by the Empire. Heraclius persuaded them to turn their arms against the Avars, and after that they held the lands they had seized in fief of the Byzantine Empire, but governed by their own Zhupans. The Thrako-Illyrian Shkypetars were thenceforward confined to the mountains of what is now Albania, the Slavs occupying what are now Servia, Montenegro, Bosnia, Herzegovina, and Dalmatia, with Ragusa as their capital. The next intruders into the Balkan peninsula were the Bulgars, and Asiatic race who crossed from Bessarabia at the end of the seventh century. They were a people akin to the Turks who were to come after them, and like the Turks they were principally a fighting race. But, whereas the Turks have always stood alone and apart in Europe, the Bulgars became Slavised, and adopted the speech and manners of the people they turned out of the eastern lands of the peninsula. They adopted Christianity in 864 under Boris, who, like his namesake of to-day, was converted, and under his successor, Simeon, about A.D. 900, they founded one of those ephemeral "empires" of the Balkans which sprang up like mushrooms alongside the more lasting and dignified Roman Empire at Byzantium. Simeon's rule extended right across the north of the Balkan peninsula, and displaced that of the Serbs who were brought under his rule. The Shkypetars were included in the Bulgarian Empire, but as before it was only the plains and not the mountains which were held by the conquerors. Simeon's rule, though he vauntingly took the title of Czar or Cæsar, was merely nominal in the west, and when he died in A.D. 927 his Empire fell to pieces. Shishman and his son Samuel, however, kept the west independent of Byzantium, with their capital at Ochrida, and probably the reign of the Czar Simeon was the period when the Shkypetars were most nearly subjugated by the Slav or Slavised intruders. But in 1018 the Empire of Simeon was utterly crushed by the Emperor Basil Bulgaroktonos, and Albania again passed under the nominal sway of Byzantium, while Bulgars and Serbs were ruled direct from the Imperial Court. In turn the spurt of energy from Constantinople died down, for, equally with the Bulgarian and Serbian hegemonies, it depended on the life of one man. A new leader arose in Bulgaria, John Asen, who claimed to be descended from Shishman. He rebelled successfully against the Empire, and, after his murder, under his successors, and especially John Asen II., Albania was contained in the second Bulgarian Empire. Nominally the Shkypetars passed from the Empire to the Bulgars, and from the Bulgars to the Serbs, and back again at every shifting of the kaleidoscope, but the hold of all the Empires was too ephemeral to allow of a costly conquest of the barren mountains. When either the Emperor or the Slavs gained decidedly the upper hand, the plains and towns of Shkyperi fell under the conqueror, but in the feeble intervals the plains, and at all times the mountains, were in the hands of that unsubdued remnant of the ancient inhabitants - the Shkypetars. John Asen died in A.D. 1241, and the leadership of the Balkan Slavs began to pass to the Serbs under the Nemanja dynasty, who first called themselves Kings and afterwards Czars of Serbia. The Stefans of Serbia fought with the Palæologi Emperors and with the Bulgarians, the Bulgarian army being crushed at the battle of Velbuzhd on June 28th, 1330. The North Albanians remained more or less independent while all these quarrels were going on around them, but in the time of the Czar Dushan, the Strangler, A.D. 1336, they were included in his Empire. After the break-up of Dushan's kingdom, North Albania was ruled from Scodra by the Princes of the Balsha family of Provence, who had taken service with the Serbian Czars. In 1368 the Prince became a Roman Catholic, and the North Albanian mountaineers have remained of that religion ever since. The Balshas greatly increased their dominions, but, in 1383, George Balsha I. was defeated and killed by the Turks near Berat, and George Balsha II. gave Scodra and Durazzo to the Venetians in return for their assistance against the Turks. But the Venetians did not afford Balsha help of any value, so the family retired to Montenegro, and were succeeded in North Albania by the Castriot family of Croja, who were pure-blooded Shkypetars and extended their rule over the whole of the country except the places held by Venice. South and Middle Albania were independent under the rule of the Despot of Epirus, Michael Angelus, who, though illegitimate, claimed to be the heir of the Emperors Isaac and Alexius Angelus. He raised the Albanian tribes, discomfited the Frankish Dukes of Thessalonica and Athens, and after his death his nephew, John Angelus, fought with John Dukas for the Empire of Byzantium, but was defeated in A.D. 1241. The heir of the Angeli then retired to the Albanian mountains, and as Despots of Epirus the family ruled the country in spite of the Emperor for several years. Meanwhile, the last of the conquerors of the Balkans was over-running the peninsula. In 1354 the Turks were invited over to Thrace by John Cantacuzenus to help him against the Palæologi. They seized and settled at Gallipoli, and in 1361 Sultan Murad I. took Adrianople. Servia was invaded, and crushed at Kossovo-Polje in 1389, where some Albanians under their Prince Balsha fought in the army of the Czar Lazar. The Sultan Murad II. advanced against Albania in 1423, and took, among others, the four sons of John Castriot of Croja as hostages. The youngest of these sons was George Castriot, the famous Scanderbeg, who was educated at Constantinople by the Sultan. In 1443 he rose against the Turks and seized Croja, and though army after army was sent against him he defeated many Viziers and generals and the Sultan Murad himself. The bravery of the Albanians and the difficulties of the mountains made the leadership of Scanderbeg invincible, and even Mahomet II., the Conqueror, was beaten by the Albanian prince at Croja in 1465. But Scanderbeg was unable to get any help from Europe, and he died in 1467, leaving no worthy successor. Croja was taken by Mahomet II. in 1478, and the next year Scodra, Antivari, and other towns on the coast were surrendered to the Turks by Venice. In the mountains the Albanians always had practical independence under the Turks, but Scodra was at first governed by Turkish Pashas. At the beginning of the eighteenth century a Mahometan Albanian chief, Mehemet Bey of Bouchatti, a village just south of Scodra, seized the city and massacred his rivals. He was so powerful that the Porte thought it wise to make the Pashalik hereditary in his family, and he governed not only Scodra but also Alessio, Tiranna, Elbassan, and the Dukadjin. 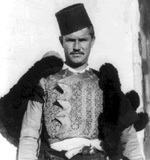 Kara Mahmoud, his son, was quite an independent Prince. He twice invaded Montenegro and burned Cettigne, and defeated the Turkish troops at Kossovopolje, but in 1796 he was defeated and killed in Montenegro. His descendants ruled North Albania, and headed revolts in Bosnia and Servia, and fought against the Sultan with success. But after the Crimean War the Porte sent an army to Scodra, and the reign of the Moslem Albanian Pashas of Bouchatti came to an end. While the Pashas of Bouchatti were defying the Sultan in North Albania, Ali Pasha of Janina defeated them in the south. He united the South Albanians, but after a long and successful career he was finally besieged in the castle of Janina and put to death in 1822. During the last half-century the country has been governed from Constantinople, but though the towns were occupied by garrisons the mountaineers retained their arms, their independence, and their tribal laws and customs. The Albanian League, which was founded in 1878 under the leadership of Hodo Bey of Scodra and Prenk Bib Doda of Mirditia, united the Mahometans and Christians of North Albania to protest against the cession of Gussigne and Plava to Montenegro, and was successful to the extent of getting the Dulcigno district substituted for the mountain towns. In spite of the exile of Hodo Bey and Prenck Bib Doda, the League has always had a subterranean existence directed against all enemies of Albanian nationality. Only in a less degree than Montenegro did Albania preserve its freedom from the Turkish rulers, and that was owing to the ease with which the plains and coast can be occupied by troops. The leading families among the Moslem Albanians have supplied a great number of civil and military officials to the Ottoman service, and these Pashas and Beys have proved themselves men of the highest ability. There will be no lack of capable rulers when the new State is constituted. The Shkypetars have not only preserved their mountain homes, but also their language and their laws. Albanian, to give it the modern name, is a very ancient Aryan tongue which was spoken by the Balkan tribes before the time of Alexander the Great. It is a non-Slavonic language, the Slav words used being simply additions made in comparatively modern times. In Old Serbia and on the borders of Montenegro the Albanians have mixed and intermarried with the Slavs, but they have only adopted a few words of Servian and not the entire language. In the south a similar process has taken place. Albanian is certainly related to Greek, and it has borrowed many words, especially among the tribes along the border, so that the purest Albanian is to be found in the mountains of Roman Catholic Mirditia and among the Mussulman families in the south of Central Albania. So much is this the case that the tribes on the Montenegrin border find some difficulty in understanding those in the districts marching with Greece. About one-third of the language is made up of words taken from Keltic, Teutonic, Latin, and Slav, owing to the invasions from which the Shkypetars have suffered; another third is Æolic Greek of a very archaic form; and the remaining third is unknown, but no doubt represents the tongue of the ancient Thrako-Illyrian tribes. Interesting speculations have been made as to the exact position of Albanian in the Aryan family, but it is absolutely agreed that it is a non-Slavonic tongue of great antiquity. It is an extraordinarily difficult language for a foreigner to speak, and the Shkypetars claim that none but the native-born can pronounce their queer consonantal sounds correctly. The difficulty of learning the language is increased by the want of a suitable alphabet. The Jesuits and Franciscans of Scodra use the Latin alphabet; in the south the Orthodox priests use Greek letters. But neither system is satisfactory, and consequently some grammarians have introduced diacritical marks, or have mixed up the two sets of characters into one jumbled alphabet. Albanian has also been written in Turkish characters, but probably with even less success, and it is a proof of the marvellous vitality of the language that it has survived through the ages without a literature, untaught and unwritten in the schools. Except where they have intermingled with the Slavs and other races the Shkypetars are tall and fair. Those who have suffered from the poverty of the mountains have no pretensions to good looks, but the average mountaineer, who belongs to a well-to-do tribe, has an oval face with an aquiline nose, high cheekbones, blue-grey eyes, fair hair, and a long golden moustache. Their bodies are straight and slim, and not so heavy as those of the Montenegrins. Even in the towns the Albanians seldom get fat, but preserve their lithe, active figures all their lives. Some of the Mirdites might pass anywhere for Englishmen of the blonde type. The Shkypetars have always been divided into two great families: the Ghegs in the north, and the Tosks in the south, the river Skumbi marking the boundary between them. No meaning has been found for the name Tosk, but Gheg is said to signify 'giant' and in the fifteenth century it was used by the Turks as a sort of title for the ruling family of Mirditia. The North Albanians are divided into tribes or clans; those to the north being grouped under the designation of Malissori, or men of the Black Mountains, including the Clementi, Castrati, Hoti, Skreli, and other tribes; those to the east including Shalla, Shoshi, Summa, and others, collectively called Pulati or the Woodlanders; and the confederation of the Mirdites, who are Roman Catholics and governed by a chief of the Doda family. At the present moment their chief is Prenck Bib Doda Pasha, who was for many years an exile in Asia Minor for his share in the League. In South Albania the Tosks are divided into three principal groups, the Tosks, the Tchams and the Liapes, and they again are subdivided into tribes. In North Albania, the Mirdites and most of the Malissori are Roman Catholics, and they are the descendants of the men who, in 1320, after the Serbian Czars, at that time holding Scodra and the plain, had abandoned Catholicism and adopted Orthodoxy, refused to give up their allegiance to the Pope. The number of Orthodox in North Albania is very small, and half the inhabitants of Scodra, many of the Malissori, a large proportion of the men of Pulati, and nearly all those round Prisrend, Jacova, and Ipek are Moslems. In South Albania the townsmen and men of the plains are principally Moslems, except towards the Greek frontier, where they are mostly Orthodox. An Albanian official reckons that nearly half of the one million eight hundred thousand inhabitants are Moslems; less than a third Orthodox, and the rest Roman Catholics. This is probably near the mark, but every statistician has his own figures and the reasons for them, though to a less degree than in Macedonia. The Albanian territories between Antivari and Dulcigno were given to Montenegro in 1880 after an armed protest by the Albanian League, and the lands of the Shkypetar now include Scodra and its plain, the mountains of the Malissori, Gussigne-Plava, Ipek, Jacova, Prisrend, Pulati, Mirditia, and the country west of Lakes Ochrida and Janina as far as the Gulf of Arta. Round Prisrend there is a minority of Slavs, and in the south below Janina there is a large proportion of Greeks, but the limits here given contain all the territories left to the Shkypetar by the successive incursions into the Balkan peninsula of Slavs and Bulgars. Happily the Serbian attempt to ignore the Albanians and to represent Scodra, Durazzo, and the plains near them as Slav because the Serbian Czars held them at intervals from the seventh to the fourteenth centuries, has failed, chiefly, it must be admitted, owing to the assertion by Austria-Hungary of her own interests, and not to any love for historical justice on the part of Europe. Except that they have not one chieftain over all the tribes, and have had a much wider extent of territory to defend against more numerous enemies, the case of the Shkypetars is exactly parallel to that of the Montenegrins. The Montenegrins held their own for five hundred years in a little block of mountains against the Turks only; the Shkypetars have held their own for considerably over a thousand years against successive waves of Slavs, Bulgars, and Turks. They have often been submerged, but they have always come to the surface again, and by their long and stubborn fight they have earned over and over again their right to the barren rocks, infrequent plains, and insignificant harbours which go to make up their patrimony, or rather what is left of it. They are the last remnants of the oldest race in Europe, for they represent peoples who preceded the Greeks. They were deep-rooted in the soil of the Balkan peninsula ages before the first Slav crossed the Danube, and if the Serb and the Bulgar have acquired a right to the lands from which they drove the ancient tribes, at least those original inhabitants have justified their claim to the rocks and shore, from which no enemy, Slav, Bulgar, or Turk has been able to dislodge them.